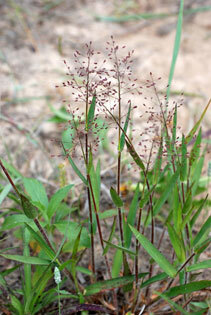 Also Called: Woolly rosette grass, woolly panic grass. Culms: Erect or ascending, simple initially, often branching with age, stiff, usually pubescent, olive-green to purplish, nodes bearded with spreading hairs. Blades: Firm, erect or ascending, variously pubescent with ascending to spreading hairs or rarely nearly glabrous, olive-green to purplish; stem blades mostly 1.6 to 4 inches long, 1/5 to 1/3 inch wide, those of later branches shorter, narrower, more crowded; rosette blades shorter, broad. Sheaths: Shorter than internodes, densely long-hairy. Ligules: Conspicuous fringe of hairs 1/12 to 1/5 inch long. Inflorescences: Panicle, pyramidal early, 1.2 to 3.6 inches long, nearly as wide, usually purplish; branches ascending or spreading, often long-hairy. Spikelets: Ovate to elliptic, to 1/10 inch long, usually pubescent; first glume about 1/3 as long as spikelet; second glume and sterile lemma nearly equal. Habitat: Prairies and open woods; sandy soils.